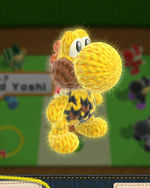 Yoshi Branches Out is the seventh level of World 4 in Yoshi's Woolly World. The level starts with a single circle platform that moves in the direction of its arrow if Yoshi stands on it. After crossing a Piranha Plant, there is an edible wall that Yoshi can eat, leading to a series of moving arrow circles that Yoshi can use to climb up the level. There is then a door next to a Fly Guy, that leads to another area with Nipper Plants and Nipper Spores. After that is an edible wall leading to the first checkpoint, followed by a series of springs with more Fly Guys. This leads to a brown warp pipe, which in turn leads to a vertical area with more Fly Guys. After that is a door leading to the second checkpoint. More moving arrow circles appear, along with even more Fly Guys and Piranha Plants and a few waterfalls. After a few waterfalls, the goal roulette appears. Smiley Flower 1: When eating the first edible wall, Yoshi must fall down and to the left to another edible wall. Eating it reveals a path to the Smiley Flower. Smiley Flower 2: Just before the end of the Nipper Spore area, in a hidden alcove near an edible wall. Yoshi must use a moving arrow circle to get it. Smiley Flower 3: There is a hidden Winged Cloud under a spring after the first checkpoint (marked by three beads) that unveils a moving arrow circle. Yoshi must ride it upwards to find the Smiley Flower. 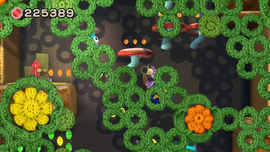 Smiley Flower 4: Using a moving arrow platform, there is an obscured door just before the door leading to the second checkpoint that Yoshi can enter. Inside the secret room, Yoshi must collect all beads to unveil the Smiley Flower. Smiley Flower 5: Just below a waterfall. Yoshi must carefully use a moving arrow circle to reach it. Wonder Wool 1: At the top left corner at the start of the level. Yoshi must use the moving arrow circle to collect it. Wonder Wool 2: Just before reaching the first Fly Guy, Yoshi must ride a moving arrow circle to the left side to an area with the Wonder Wool. Wonder Wool 3: In a hidden Winged Cloud in the area with Nipper Spores. Wonder Wool 4: In the vertical area with Fly Guys, over in a visible alcove over to the right. Wonder Wool 5: Just above a group of two Fly Guys after the second checkpoint. Collecting all of the Wonder Wools knits Leopard Yoshi back together. This page was last edited on October 31, 2018, at 06:30.